Two U.S. Air Force (USAF) B-52H Stratofortress strategic bombers conducted a training mission with the U.S. Navy and Japan Air Self Defense Force (JASDF) over the East China Sea on March 20, according to the U.S. military. “Two B-52H Stratofortress bombers took off from Andersen Air Force Base [AFB], Guam, and conducted integration training with the U.S. Navy, Koku Jieitai [Japan Air Self-Defense Force] and F-15C Eagles assigned to the 18th Wing, Kadena Air Base, Japan, in the vicinity of the East China Sea,” the U.S. Pacific Air Forces (PACAF) said in a statement last week. PACAF did not provide additional details. Two B-52H Stratofortress strategic bombers also conducted a patrol over the East and South China Seas on March 4. Notably, B-52Hs launched from Andersen AFB in Guam and a base in England conducted “simultaneous theater familiarization training in the Indo-Pacific and Europe” on March 18. B-52H bomber flights involving the East China and South China Seas are frequently denounced by China, which is in involved in territorial disputes in both waters. 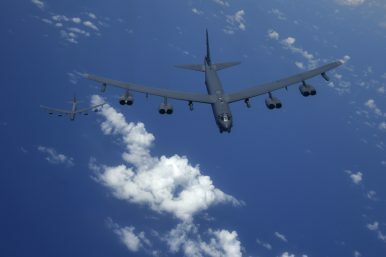 The service redeployed the B-52H to Guam as part of the U.S. Indo-Pacific Command’s continuous bomber presence mission in the Asia-Pacific region in January. B-52Hs last deployed to Guam in July 2016. The B-52Hs took over responsibility from the B-1B Lancer heavy strategic bombers of the USAF’s 9th Expeditionary Bomb Squadron (EBS) of the 7th Bomb Wing, which deployed to the region in February 2017. The USAF has routinely stationed B-1B, B-52H, and B-2 Spirit bombers at Anderson AFB since 2004. The service has 58 B-52Hs operationally deployed. The B-52H is nuclear-capable. Notably, under the 2010 New Strategic Arms Reduction Treaty (START), 41 B-52Hs were denuclearized.